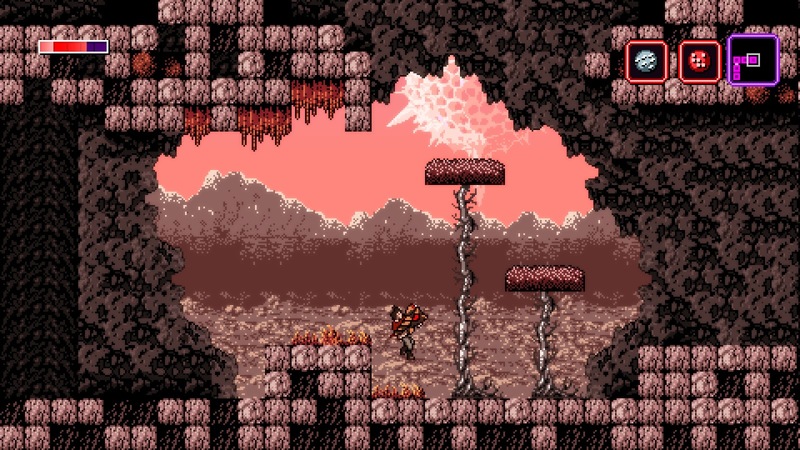 Axiom Verge has come to the Nintendo Switch, and while the game has been out on several platforms over the last few years, it holds up just as well now as it did when it released then. It's retro sensibilities have allowed it to age flawlessly, making it just as compelling to play now as it was upon initial release. If for some reason you have not had a chance to play this Metroid-style game yet, and you have a Switch, you really should pick it up if you are a fan of action / adventure games. The timing is actually kind of interesting for this release, seeing as Axiom Verge's initial release filled a hole in the hearts of Metroid fans. For whatever reason, Nintendo had long neglected the Metroid series, with fans of the classic titles looking for something that just was not out there. Until Axiom Verge came out, that is. Now Nintendo has been paying more attention to this particular fan base, even having released Metroid: Samus Returns on the 3DS a few weeks ago. It is great to see Samus back, but the same can be said of Trace, a lead scientist who wakes up in a strange location after a terrible accident tears through his laboratory. A strange, distant voice serves as his call to action, encouraging Trace to pick up weapon and tasking him with new objectives as the exploration of this strange world known as Sudra begins. The story is actually in many ways stronger than the original Metroid titles that clearly inspired Axiom Verge, because back then narration was really just not a point of emphasis. 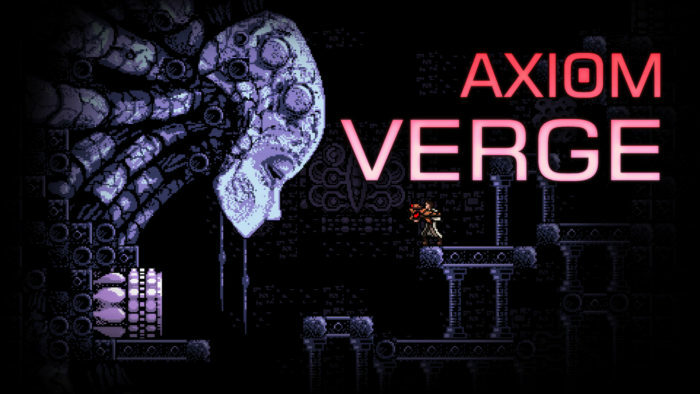 So right out of the gates, Axiom Verge gets us going with an interesting enough story. It may not have RPG quality plots in play here, but it is more than enough to inspire our interest in seeing Trace through his adventure. Where Axiom Verge really shines however, is in exploring Sudra and its fascinatingly structured puzzle-like environment. One of the things that always made Metroid so much fun to play was that the game's worlds had a puzzle-like quality, often teasing us with some item or some doorway that Samus does not yet have access to. As she continues her adventures however, and gains new abilities, what was once out of reach would later become available to her. This structure is recreated for Trace in Axiom Verge as new weapons, health improvements and different tools become available to him throughout the adventure. 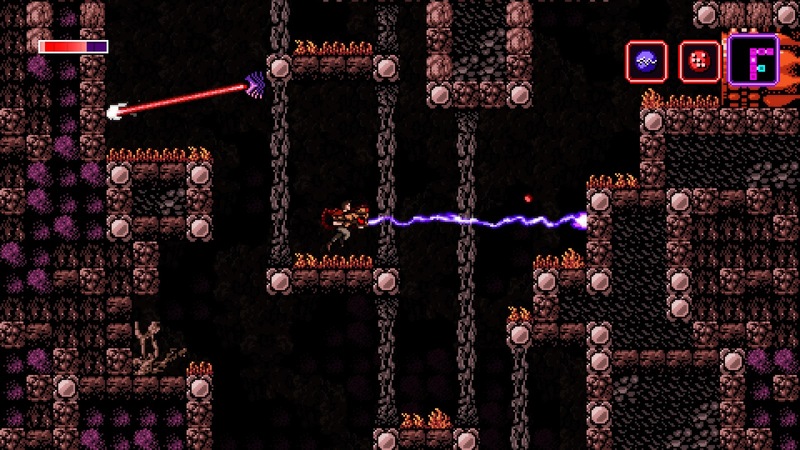 The formula is familiar, and it has been borrowed for many games over the years, but Axiom Verge deserves credit for nailing it in a way few others really have. This goes beyond just the level design, but is also a testament to the enemy construction as well. What works for one enemy will do nothing against another. You need to consider the best approach for the situation, and Axiom Verge is at its best when it combines different enemies in a singular space, forcing you to think and act both quickly and strategically. There is a theme of 'glitches' throughout the game, and the 'glitch gun' is a fascinating idea. It can certainly be used to help Trace reach new heights, accessing areas not normally available and even give him a leg-up on enemies. At the same time, some enemies when impacted by it actually become more difficult to deal with. After all, a 'glitch' is not always helpful - it's simply a change in something's expected behavior. This encourages some trial and error experimentation as you progress through dark, science fiction world with a distinctively retro style of visuals. 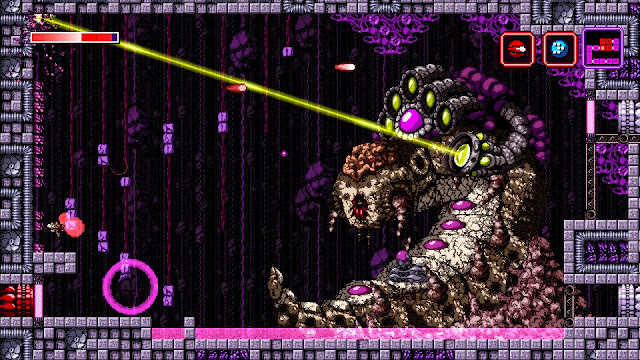 While Axiom Verge is not a technical marvel in terms of graphics, the style is distinctive and enjoyable and has helped the game hold up just as well today as it did upon initial release. Unfortunately, things are not completely roses, even with this latest release of the game. While I really love the fact that Axiom Verge is portable (it looks great on the small screen, the pixelated visuals looking more at home on the go than they do on a large 50-some inch television even), fans of the game on Wii U such as myself will likely miss the incredibly handy second screen that allows you to glance down at your lap and see things like your inventory on the fly without needing to pause and bring up an actual menu screen. Of course, that says more about Axiom Verge's fantastic implementation of the unique Wii U hardware than serve as an actual complaint about the game itself. Also, I have never been a huge fan of the vague map on display here. It is not a deal killer, but it is a feature that I suspect was intentionally made a little vague, but it is often times not as helpful as I would like it to be. 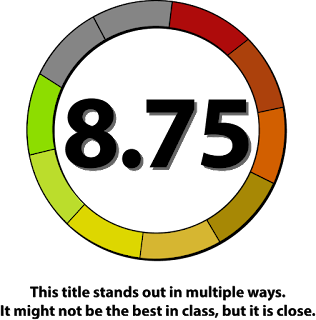 These are however, relatively small quibbles when measured against the overall quality of the game. Metroid fans really should feel right at home with Axiom Verge, which manages the difficult act of respecting and paying homage to the Metroid series while presenting enough originality to make this a unique game in and of itself. 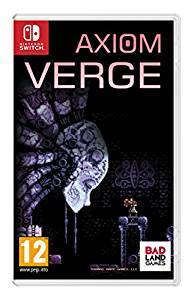 Now that we have seen Axiom Verge on just about every format available, I am looking forward to seeing what Tom Happ does next - here is hoping he has another game in the series cooking up for us sooner than later.